Building up your fitness before a skiing holiday is one of the best ways to avoid suffering an injury on the slopes. Andrew Davies, a consultant orthopaedic surgeon at London Bridge Hospital, claims it is important to prepare your body for the rigours of the sport, which can often take its toll on those who have not done any training beforehand. 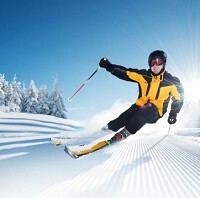 Winter sports insurance is a good idea, as a tumble or three is usually par for the course on a skiing holiday. But prevention is better than cure, and getting in the gym prior to a trip can be the difference between an injury free time and at least one visit to accident and emergency. It is very easy to forget you will be skiing at high altitude, where there is less oxygen. This means you will feel out of breath very quickly if you are not fit. Davies also says skiers should be honest about their ability, while steering clear of any alcohol when out and about on the slopes. You will be at a greater risk of injury if your bindings are too tight, especially if you are only a beginner. You should therefore be open and upfront about your skills when hiring equipment at the shop on site. Drinking alcohol on the piste, meanwhile, is a recipe for disaster. It could also invalidate your sports travel insurance, so do not drink and ski in any circumstances. Making sure your boots fit properly is another important aspect that will help keep your safe when speeding down a slope. Having your boots done up too loosely can reduce the amount of control you have, increasing the chance you will have a crash. Last, but by no means least, Davies encourages skiers, including experienced ones, to obey the rules of the mountain at all times. Be aware of the presence of others, just as you would when driving, as it is often someone else's mistake that ends up costing you.